No, it’s a reasonable question. I sometimes grind the whole pods in a sharp spice/coffee mill then rub it through a sieve and keep the powder, tossing away the bits of skin. This is especially useful when you need the powder from a large quantity of pods, like when making carrot halava for 800 people 😉 I guess it’s the lazy, quick, but wasteful way. The slow, traditional and frugal way is to open the pods by hand, then grind the seeds. You can use a granite mortar and pestle for this if you like. Shop-bought cardamom powder is vastly inferior, by the way. Hope this helps, Kind regards, Kurma. I never answered that question. Sorry DevaDeva. Here it is: I am generally under-impressed with the quality of cardamom seeds available out of the pods. They tend to be of an inferior quality, and stale. Having said that, I have on occasion found some excellent ones out of the pods – oily, shiny and very aromatic. They were obviously fresh. 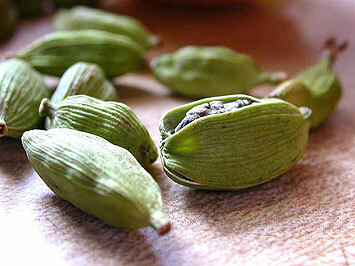 If you find cardamom seeds that appear to be of this quality, buy some in small quantity. In fact, beware of the ‘buying in bulk’ practice when it comes to all spices. They lose their flavour over time. Finally, my experience is that the greener the cardamom pods, the more aromatic they are.